An electric arc furnace is heated upto 1800°C by the electricity that is generated through electrodes. Electric arc furnace is used for high-melting-point alloys such as iron and steel. This method is mainly used in mini mill where scrap steel obtained from used automobiles and other products is recycled . History: The first electric arc furnace was made in 1907 by a Frenchmen Paul Heroult, and the first commercial use of electric arc furnace was started in USA. These furnaces were widely used in WorldWar II to alloy steel and later electric steel making began to expand. Since the cost of establishing an electirc arc furnace was less, so they started flourishing throughout Europe. Types of Electric Arc Furnace: There are various type of electric furnaces that are available which can carry from 1 ton to 400 tons of melting works. The carbon rods that penetrated in the furnace can be two or three in numbers. And the roof can be fixed or tilting with the furnace. In modern day electric arc furnace the furnace can be tilted to both side. Electric Arc Furnace Process: An electric arc furnace mainly consist of the spherical shaped furnace, a retractable roof with electric rods and a refractory material dressed hearth for collecting the molten metal. 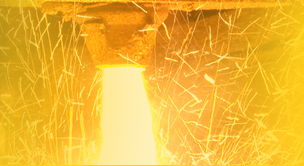 The scrap steel or the iron is placed in the furnace and the electric rod made of graphite is passed into it. The scrap or metal is melted by the electroc current passed through the rods and the radiant energy produced by the arc. Once the metal is melted the doors on the sides are opened to remove the alloy, slage and the oxygen that is formed. After charging, the roof is swung back over the furnace and meltdown commences. The electrodes are lowered onto the scrap, an arc is struck and the electrodes are then set to bore into the layer of shred at the top of the furnace. Lower voltages are selected for this first part of the operation to protect the roof and walls from excessive heat and damage from the arcs. Advantages: Electric arc furnaces are are pollution free and have outstanding metallurgical control. 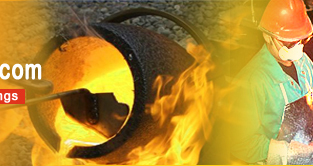 The advantage of a electric metal casting furnace is that temperature can go up to 1800 Celsius. Large reduction in specific energy (energy per unit weight) required to produce the steel. Another benefit is flexibility: EAFs can be rapidly started and stopped. A typical steelmaking arc furnace is the source of steel for a mini-mill, which may make bars or strip product. Mini-mills can be sited relatively near to the markets for steel products, and the transport requirements are less than for an integrated mill, which would commonly be sited near a harbour for access to shipping. Some of the disdvantages: Lost of sound levels, can be produced only in place energy is available in a large scale and the movement of scrap through thelocality can cause health hazards. Electric arc steelmaking is only economical where there is plentiful electricity, with a well-developed electrical grid.